Outsider Adrian Delia jolted the core of the Nationalist Party when he won the majority of councillors’ votes at the end of a bitter campaign to succeed Simon Busuttil. Dr Delia, a prominent lawyer and Birkirkara FC president, obtained almost half of the councillors’ votes, despite being in the limelight in recent weeks regarding his alleged involvement in the so-called ‘Soho prostitution racket’, an issue instigated by blogger Daphne Caruana Galizia. He has vehemently denied all allegations. Dr Delia will go head-to-head against former minister Chris Said who obtained 425 votes. Alex Perici Calascione was eliminated after winning 296 votes, while ultra-conservative Frank Portelli performed abysmally, winning just 11 votes. The result provides no clear-cut winner since it will be now up to the circa 20,000 PN members to decide who should lead the party against Joseph Muscat’s Labour government. Should Dr Delia win the September 16 election, he will need to rely on an MP to cede his seat. He would also have to win the trust of some MPs, who have openly objected to his candidature. Simon Busuttil decided to step down as PN leader after his party succumbed to a second major defeat in the June 3 election. Adrian Delia supporters cheer as the outcome became clear. 11.50pm: Speaking to reporters, Chris Said confirmed his intention to keep fighting in the race. Though he said he would not exclude dropping out of the contest at a later stage, he said that at present he felt party members had a right to have a choice. “Come what may I will remain loyal to the party and its leadership,” he said. He thanked all three candidates and said that from now onwards the message needs to be one of unity. “This is the start of the process which will make the PN a winning party once again,” he said, adding that nobody was greater than the party. The lawyer's supporters leave the PN headquarters in a carcade. 11.05pm: Official results show Adrian Delia obtained 616 votes, Chris Said won 425 votes, Alex Perici Calascione won 296 votes, and Frank Portelli just 11 votes. There were six invalid votes. The result means there will be no need for another election tomorrow since both Dr Perici Calascione and Dr Portelli were eliminated. 10.45pm: In a tweet, Chris Said thanks councillors and their teams and says that whatever the result, PN should emerge stronger. Meanwhile, Robert Musumeci weighs into the debate with a tweet saying #GaliziaBarra. 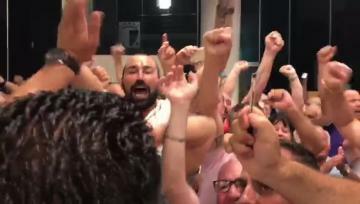 10.35pm: Adrian Delia supporters cheer at PN headquarters as sorting shows the Birkirkara lawyer obtained the biggest share of votes. 10.25pm: Counting starts. 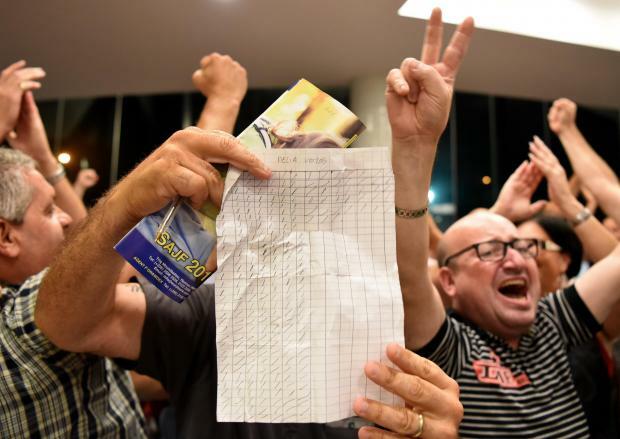 Our reporters on the ground say Adrian Delia got a lot of votes from councillors. Chris Said and Alex Perici Calascione battling for second place. 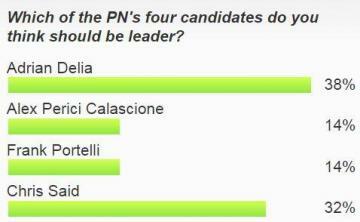 Frank Portelli is trailing way behind. 10.15pm: Electoral Commission head Joe Borg says a total of 1,354 have been cast. That means just over a dozen councillors didn't vote. That's quite incredible for an election in which many critics lamented that none of the four candidates would make a suitable leader. Meanwhile, Italy are trailing 3-0 to Spain, which means their participation in next year's World Cup could be in the balance. 9.45pm: Just to sum up the process: Today we will see one, probably two candidates eliminated, with a run-off election taking place tomorrow if the third-placed candidate doesn't drop out. The final two candidates will go head-to-head in the second round on September 16 and for the first time, all party members (there's around 20,000 of them) will be entitled to choose the new leader. Adrian Delia, Chris Said, Alex Perici Calascione and Frank Portelli. 9.35pm: Former PN MEP candidate Jonathan Shaw gives sound advice to the new leader: don't surround yourself with 'yes men', avoid the tribal mentality, and rope in people from outside the party. 9.15pm: The voting process is over and counting will start shortly. Many wonder why it should take almost two hours to count just over 1,300 votes. Meanwhile, Spain have gone two up against Italy. 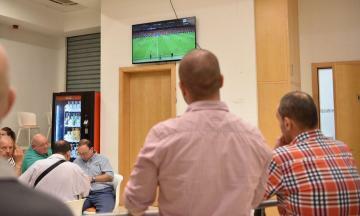 9.05pm: As counting is about to start, some councillors can't stay away from the TV screens at the PN headquarters to watch Italy take on Spain in a crunch World Cup qualifier. Spain have just gone ahead, but a fine header by Bellotti almost grabbed an equaliser. 9pm: Deputy leader Mario de Marco says the biggest challenge for the new leader is to unite the party. "This is one party. Not a party of factions," he says, warning that populism doesn't win you elections. He says it was a "privilege" to serve under Simon Busuttil. 8.30pm: There has been a strong councillor turnout voting in Gozo - and that could only mean overwhelming support for the only Gozitan in the race - Chris Said. 7.40pm: Meanwhile, blogger Daphne Caruana Galizia has kept up her relentless attacks against Dr Delia with a series of posts uploaded throughout the day. A video showing him passionately addressing supporters on the eve of the election has been described by critics as a desperate last-minute attempt to drum up support. According to One News, the tension outside the PN headquarters is palpable. The Times of Malta poll result at 4pm today. 7.30pm: According to our readers who took part in an online poll there are two clear favourites for the post, newcomer Adrian Delia and former minister Chris Said. There will be a face-off between the two candidates winning the highest number of votes in two weeks’ time in an election open to all card-carrying PN members. These number about 20,000. 7.25pm: No punches were spared in this campaign as Adrian Delia, Chris Said, Frank Portelli and Alex Perici Calascione vie for the party's top post. Just this morning, Dr Portelli played the victim card and uploaded a Facebook post saying that l-Orizzont had pledged support for Dr Delia, while The Sunday Times of Malta was supporting Daphne Caruana Galizia's "puppet" Dr Perici Calascione. Frank Portelli's post this morning. 7.15pm: Almost 1,400 councillors are eligible to vote. Councillors have been going in and out of the PN headquarters since 9am. Voting comes to a close at 9pm. Former Prime Minister Lawrence Gonzi and outgoing leader Simon Busuttil were among those casting their vote. 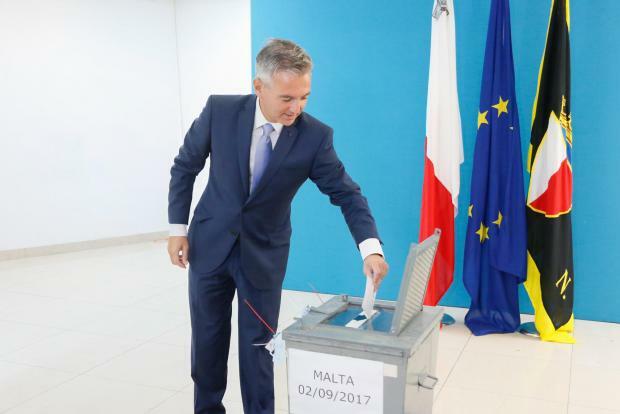 Simon Busuttil casting his vote.